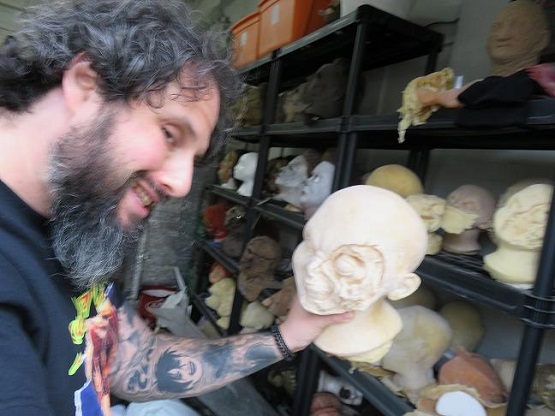 Carlos Henriques, one of the founders of The Butcher Shop. In putting together this site, we’ve been lucky enough to meet lots of up-and-coming talent. 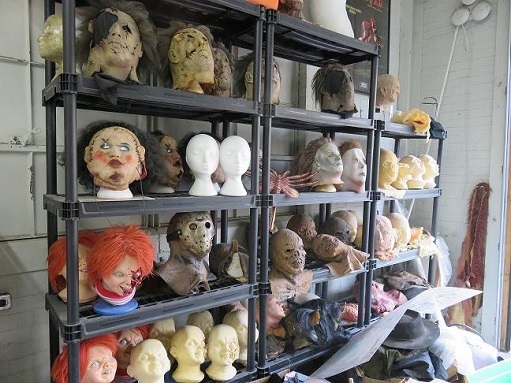 This most definitely includes Carlos Henriques, one-half of The Butcher Shop, effects guys who specialize in designing and creating unique and high-level makeup effects, creatures, prostheses, human replicas, specialty props and gore effects. 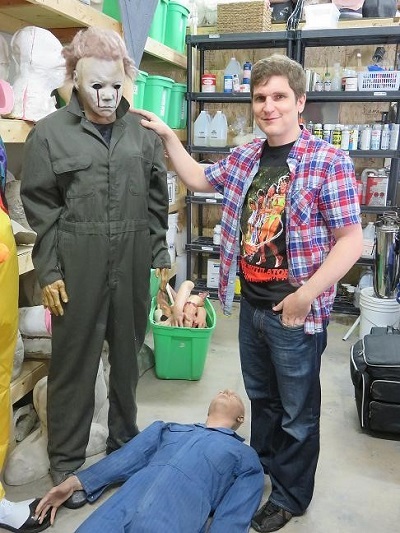 They had a booth at Horror-Rama 2015 where we met Carlos and we were invited to check out his place of business. We leapt at the opportunity like it was a jump scare. 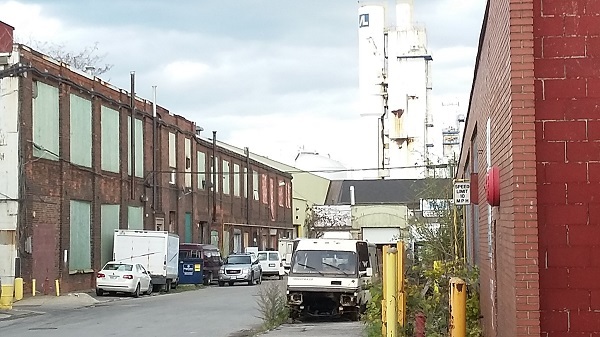 We decided to make an afternoon of it, heading out to an industrial hinterland of Hamilton that could’ve been cutting room floor remnants for the intro to The Sopranos. It was pretty darn appropriate. 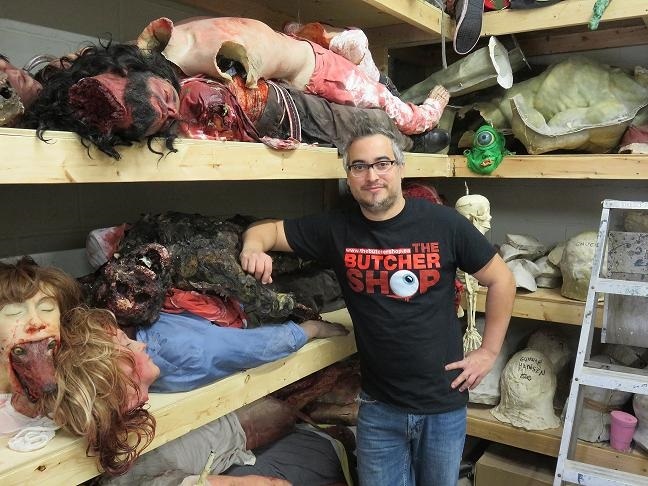 The Butcher Shop has got IMDb credits as long as your (severed) arm and it was fantastic to be able to hear about the men and women behind practical special effects wizardry. They’re responsible for effects in Berkshire County, Aladdin and the Death Lamp, Bottom Feeder, Celebrity Death Match, and the incredible short, Heir to name but a few. A feast for the senses. Look at all this amazingly cool stuff. 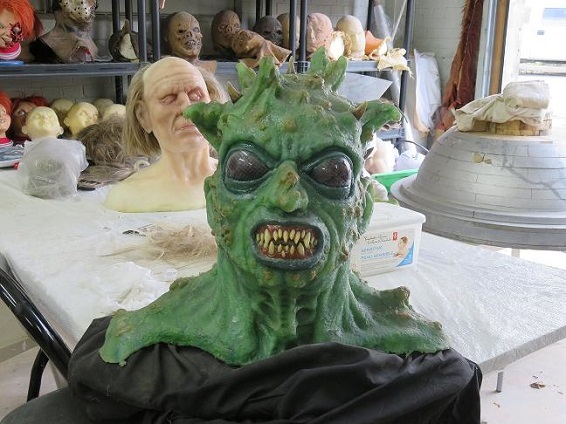 Practical effects can make or break a horror film. Today’s over-reliance on CG is to the genre’s detriment. 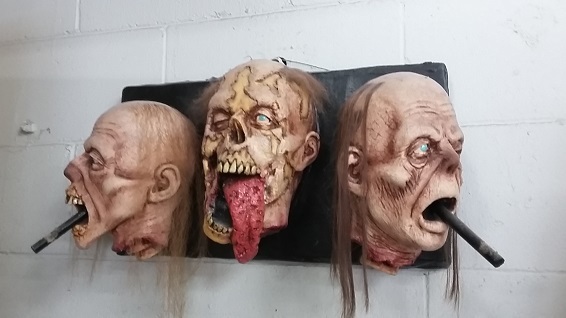 Nothing beats a cool set-piece involving some of these masks/props. And because we’re hams, we couldn’t help but get in on the action. A big thanks to Carlos and his team. This was something we’ll never forget. This entry was posted in Horror and tagged Canadian film, horror podcast by Really Awful Movies. Bookmark the permalink.